It's the start of a new challenge at Ike's World and this time we'd like you to do something which really expresses the "YOU" of you - in other words, "Be You." Remember, we're always an "Anything Goes" challenge and the theme is jut an option you can follow if you choose . Nothing is more 'me' than being in nature. In my younger days, I was most alive when I was camping or backpacking in the woods so this "Rockies" image from Ike's Canada Bundle in her World Tour series is a perfect reflection of that. The psalm I used for the sentiment is my favorite Bible verse so it's another thing which is definitely "me." I colored the image with ProMarkers and white gel pen, die cut it with a rectangle die from Spellbinders, and mounted that onto the piece with the sentiment. I added it to a layer of torn and distressed CS, wrapped the ribbon and tied the bow, then put it all onto a white card base, leaving the design rather CAS. Although this is a card perfectly showing "me being me," I think it also makes a great masculine card. How super that is. I love the use of the white gel pen. I could just walk right into that scene. Thank you for making this for me at IWC. Such a beautiful scene, I can see why it appealed so much to you. Love all the blues you used to echo the wintery pic. Thanks for playing at AAA Cards. This is gorgeous, I love the beautiful topper and wonderful quote. GORGEOUS! That scene is awesome and so is your card Connie. So beautiful. What a gorgeous scene and it is coloured so beautifully too. What a fantastic idea for a masculine card to take your breath away! GORGEOUS card with a lovely verse to suit. 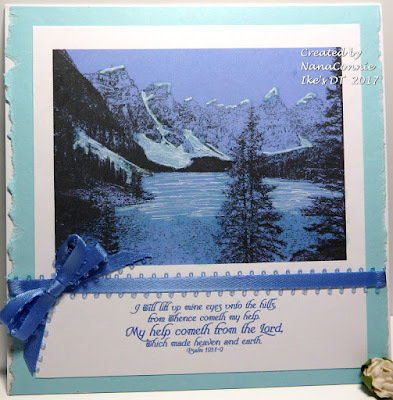 What a beautiful and peaceful scene on your card and you colored it perfectly! Thanks for playing along with us at DL.ART Challenges! So very beautiful, love your colouring, I thought it was an actual coloured photo. Impressive. Do love my Canadian Rockies! A wonderful scene for your card. Thanks for sharing with us at Aud Sentiment's and hope to see you again soon.